Traditionalist Anglican leaders are threatening to snub the new Archbishop of Canterbury in a furious row over gay clergy. 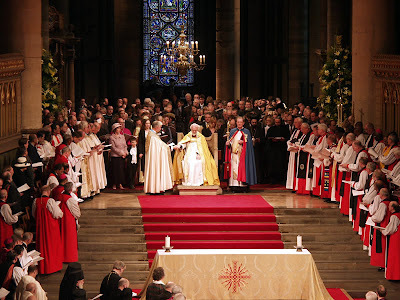 Conservative archbishops from Africa and Asia, who are among Anglicanism’s most senior clerics, are planning to boycott a meeting called by Archbishop Justin Welby that is scheduled to take place after his enthronement this week. 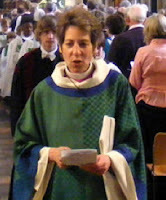 The leaders are flying in for Archbishop Welby’s formal installation service in Canterbury Cathedral on Thursday. The archbishops are stamping their feet, too. 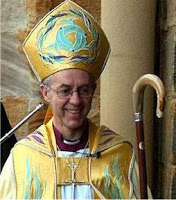 The African prelates, the Primate of Kenya, Archbishop Eliud Wabukala, the Primate of Nigeria, Archbishop Nicholas Okoh, and the Primate of Uganda, Archbishop Stanley Ntagali are angry because the Church of England will allow partnered gay clergy to become bishops, so long as they promise to remain celibate. They wasted no time throwing down the gauntlet. I hope and pray the Archbishop of Canterbury does not give in to the bullying tactics. They are also unlikely to sit at the same table as their liberal counterpart from the United States, Presiding Bishop Katharine Jefferts Schori, who has already consecrated openly gay bishops. Fear of contamination? Or is it immaturity? With their threat not to sit at the same table as Katharine, they remind me of children in an elementary school cafeteria. 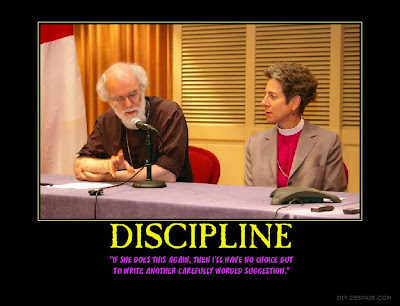 The three archbishops need to grow up. If Justin gives in to the bullying, they will not be appeased but will smell weakness and follow up with further demands. We've seen this drama before, and I, for one, am tired of it and bored with it. Doug has very kindly been searching for the Episcopal Church take off on the New Yorker cover pictured here. He did not find what he was looking for, but he found the image below. Click on the picture for the larger view.